Time to re-enter the Vinyl Age, paw back through those 45s. Remember the "Tennessee Hound Dog Yodel"? "Albino Pink-eyed Stallion"? Remember Marvin Rainwater? In the 1950s, Rainwater was a frequent guest on Arthur Godfrey's TV show. Maybe you saw him, wearing his Indian headband. Rainwater had a string of country and rockabilly hits, but pretty much fell off the radar in the 1970s. Turns out he's been living the quiet life in Aitkin County, playing guitar and tending his dahlias. Here is his story. Marvin Rainwater: Yeah, Momma took in washin' so I could have a piano and take classical lessons when I was 6 years old. I was studyin' Rachmaninoff and Beethoven and Paderewski and all those, when I was 6 years old. I lived for it, I couldn't think of anything else. I'd sit on that piano bench eight hours at a time. My Daddy'd come home say "Stop that noise. Go. Get outta here," and I'd have to go out and play. 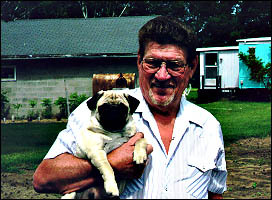 Marvin Rainwater is 73 now, living in a turquoise trailer house behind a burned-out convenience store on the flats of Aitkin County. A sign on the store says "Bluebird Corners" - a nod to his hit song from 1957. There were no trailers or hillbilly songs in Marvin's early dreams; growing up in Depression-era Oklahoma, he felt chosen for the classics, despite his father memorizing whole works for hometown recitals. Then, at fifteen, a mishap removed part of his left thumb - and his concert ambitions. Rainwater: I was workin' in a garage to help pay for my music lessons, and I got it caught in a machine, and it cut the end of it off. It's okay now, it's shrunk back down, I can play piano again, but for six or seven years this was the size of a apple. 'Bout the size of a lemon I guess, hanging down there, I couldn't hit less than three notes at a time with that. Wrecked all that fancy playin'... hm hm, so that's a situation I don't like to recall. But when I went in the Navy, I was so lonesome for my music, and I couldn't have it, see, because of my thumb...then we was out on the ships and everything, and these guys would start singin' "Way back in the hills, da da da" - well that got to my soul, way down deep, and I didn't like it, but it still got to me. And the more I hurt, the more it got to me, cause it was real, and eventually I figured there's something more than quality there, the nasal voice and all, there's something behind it that's great. Then I started writin' songs and naturally it fell back to my roots as a boy in Oklahoma, and they turned out to be hillbilly songs. "I Gotta Go Get My Baby" - recorded here for MGM - was an early Rainwater tune his brother Ray parlayed into a TV appearance with Arthur Godfrey in 1953. By now, Marvin had come up with an Indian persona. He isn't Indian, that he knows of, but it worked with his last name. He wore a headband and fringed leather jacket. He wrote lyrics about his Cherokee brothers. He had the suit, the songs, and the ambition - but needed a big break. And as everyone knew in the early fifties, Arthur Godfrey was in the big-break business. Rainwater: Hey you wanna hear another strange story? My life is nothin' but one strange story. Ray said to tell those people up there - hope they ain't listenin' - tell those people Marvin's been workin' in the Shamrock Club off and on the last year or two. So he did, he told 'em that, and they said, "Really? He been working there?" "Yeah." "Well, how come we ain't heard of him? " "Well I don't know, he been there ever few months." Now in Georgetown, there was a little club called the Shamrock would hold forty people. And that's the club I'd worked off and on for nothin', for free - he he - and one they was thinkin' about was the Shamrock in Houston, it would seat 2,500 people - well, see, they neglected to tell 'em the difference -ha ha ha - see, they talked 'em into it then left it up to me to go out and do it. Rainwater won a contest on Arthur Godfrey's Talent Scouts - the 50s version of "Star Search" - a performance that brought him national exposure and eventually a recording contract. He played regularly on Godfrey's popular morning show and on Red Foley's Ozark Jubilee. He toured with conviction - and the best musicians he could find. By the mid-fifties, Rainwater had started mixing straight-ahead country and western with the emergent, big-beat rockabilly sound. It cost him some fans, but in 1957 he recorded the song he's best known for - the song he refers to simply as "the Bluebird." "Gonna Find Me a Bluebird" went to number three on the country charts and 18 on the pop charts at the same time - one of the earliest crossover hits. It made Rainwater an attraction overseas as well - another hit, "Whole Lotta Woman," pushed Elvis Presley out of number one for six weeks in England in 1958. But success was slippery. After he began hitting the charts, a small studio where Rainwater had recorded early demo tapes sold the tapes to a number of disreputable record labels; the companies dubbed new tracks over the demos and released them. Rainwater: They sold a million of my albums at $.88 apiece, and it destroyed my career, my credibility was shot on account of those cheap records, they were demo tapes, not even actual recordings, and they dubbed music in on top of it, got out of meter, didn't know the melody or anything. It was horrible, and the sound was real cheap you know; on account of me having "The Bluebird", this was after I did "Bluebird", then they put all this stuff in the market, see, flooded the market with these cheap albums - and my credibility was shot. Photo Credit: Leif Enger, MPR By the 1970s Rainwater's vocal cords were also shot. Suffering from throat cancer, he and moved to Aitkin County, where he made a slow recovery. He spends a lot of time gardening, and is almost finished building a new lake home. In recent years he's been playing again - at casinos, and in Europe, where a four-CD Rainwater retrospective has just been reissued.